As far back as the 8th century there are records of an area called the Land of Promise estate situated on the Isle of Dogs at Marshwall (now Millwall) on the north bank of the River Thames. In 1835, Scottish Engineer, Sir William Fairbain (1789-1874), purchased the Land of Promise estate and in 1836, he established the Millwall Iron Works on a 3-acre site for the production of small ships (<2,000 tons). 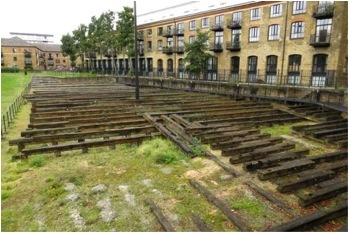 In 1839, another Scottish engineer, David Napier (1790-1869), acquired the shipyard next to the Millwall Iron Works, which was to be run by his two sons and it was in these premises that Isambard Kingdom Brunel (1806-59) would build the SS Great Eastern, the largest iron steamship of the age, a project that would lead to his demise. Although Fairbain constructed between 80-100 ships on the Isle of Dogs, the business was not a financial success and in 1848, the site was sold to John Scott Russell (1808-82) and partners. Scott Russell built fully fitted out ships in dry docks, which were then floated out onto the River Thames ready for sea trials. The company’s first commission was for the iron steam ship Taman. This was built for the Imperial Russian Government and was completed by the end of 1848. Scott Russell also built two ships designed by Brunel for passenger runs to Australia. These were the Adelaide and Victoria and were similar in design and size to Brunel's famous SS Great Britain, launched in 1843 and the first iron steamer to cross the Atlantic. However, these 3,400 ton vessels had problems with refuelling and carrying sufficient fresh water on the long runs involved in the route to Australia. This led Brunel to think in terms of a larger ship for such a voyage. Scott Russell was a major driving force behind the Great Exhibition of 1851, working closely with the Prince Consort, Albert of Saxe Coburg and Gotha (1819-61). Brunel and Robert Stephenson (1803-59) were also members of the planning committee and it was during this project that Brunel’s ideas for a great iron ship were developed. Henry Thomas Hope (1808-62) had set up the Eastern Steam Navigation Company with the intention of securing the lucrative Royal Mail subsidies for the Orient. Unfortunately he lost the contract to the Peninsula & Oriental Line and so, when Brunel approached him with his scheme, he agreed to use his company to raise the necessary £600,000 capital to build the huge iron ship. This represented the largest shareholder investment of its time. The vessel, initially dubbed the Leviathan, was to be 693ft long and 120ft in the beam. She was to have six masts and five funnels. There were to be two sets of engines; one set would turn the 58ft paddle wheels and the other would turn a 24ft propeller. In addition she would carry 6,500 square yards of sail, an area on a par with the clipper ships of the time. She would have a gross dead weight of 12,000 tons and a displacement of 22,500 tons. She would become the largest iron ship ever built. The original concept, the cellular construction and the joint use of paddle and screw were all Brunel's ideas. However, the ship embodied the wave-line form, the longitudinal system of construction, the complete and partial bulkheads, and other details of construction, which are unmistakably Scott Russell’s design ideas. Scott Russell was held in high regard by Brunel, who made him a partner in his project, and Scott Russell’s company was awarded the contract to build what would become the SS Great Eastern. The contract for her construction was signed on 22 December 1853 and work began on 1 May 1854. The vessel was too large to be launched from the Millwall dry dock, as Scott Russell’s smaller vessels had been before, so it was agreed to launch her sideways. To achieve this Russell had to lease the Napier Yard next door. The hull would be built on two massive wooden cradles which rested on 120 iron rollers, set up on 160 railway rails, supported on a 2ft deep concrete base, overlaying 2,000 timber piles driven 30ft through the mud into the gravel bed of the Thames. The Isle of Dogs reverberated to the sound of two hundred riveting gangs, who worked for six days a week to insert 3 million one inch rivets in the ship’s plates. On the outside of the ship, two men hammered alternately at the white-hot tip of the rivet, which was held in place by a man inside, between the double hulls. The rivet holder worked by the light of a candle and was served by three boys; one tended the forge, the second brought the white-hot rivet to the work site and the third boy placed it in the hole. The inside crew worked in this confined space for 12 hours, to the sound of 400 riveting hammers echoing around them. During construction a worker fell to his death, another died in the cavity between the hulls, and a riveter fell from his working platform onto another worker below, killing him. Another casualty was a visitor to the yard, who somehow managed put his head over a pile when the monkey came down, crushing his skull. A further two workers were reported missing and never accounted for. Despite these terrible incidents it appears that the builders were proud of their safety record and low casualty rate. Soon after construction started, the price of iron plate increased significantly; this put a lot of pressure on Scott Russell, as he had bid a low price to secure the contract. After two years of construction the money ran out, work was suspended and Brunel was removed from his position as company engineer. Brunel raised more money and moved into a rented house close to the Napier Yard. When work resumed after three months, Brunel continued to direct activities but without any official connection with the Great Eastern Steam Navigation Company. preparations began for the launch. The ship was 350ft from the high tide mark and on an incline of 1 in 12. She was the heaviest single object that man had ever tried to move. A complex plan using a combination of hydraulic rams, steam winches, and steam tugs with associated chains and cables was developed. The launch date was announced for 3 November 1857, when the ship could be floated on a rising spring tide. Brunel explained to the directors that the launch would be a long and tedious process and could take up to eight hours, and the key requirement for success would be ‘absolute silence’, so that the orders could be heard clearly by the personnel involved in the launch. However, the directors were anxious for some return on their investment and issued thousands of tickets to influential people to witness the launch. Grandstands were built on surrounding properties, watermen charged groups of spectators to witness the launch from the river and the shipyard workers were invited to bring their families into the yard as well. The local pubs did a roaring trade and brass bands played at various locations along the river front. Henry Hope’s daughter, Henrietta, christened the vessel the SS Great Eastern and the serious business of the launch commenced. Things did not go well. The vessel began to move and Brunel gave the order for the hydraulic rams to push. Unfortunately, the crew on the 60 ton stern checking drum stood back in awe and failed to do their job. The vessel took up the slack in the chain and sent the windlass spinning in reverse. The huge handlebars caught over a dozen bystanders and sent them flying. Spectators and workers ran in panic. Thanks to the presence of mind of Brunel and the foreman of the forward drum crew, Ned Hepworth, the ship’s uncontrolled slide was checked. However, the ship was now stuck at an angle on the slipway and could not be moved. Chains were broken and gears stripped but the ship refused to budge. Brunel finally conceded defeat and signalled the end of the day’s attempt. Two men on the windlass had been killed and many others injured in the mayhem that followed the ship’s uncontrolled slide. Brunel convinced the directors that the public should be barred from further attempts to launch the Great Eastern. He borrowed more chain, recovered the broken chain, then installed heavier timbers and piling. By these endeavours he managed to move the vessel another seventeen feet nearer the river by the eve of the next spring tide. The second attempt saw Brunel move the ship another 14ft, but an unofficial sightseers’ gallery erected between two neighbouring house tops collapsed, flinging 100 people to the ground. Cart loads of injured were hauled off to Poplar hospital but fortunately this time, there were no fatalities. Brunel continued to work and in the next two days, he succeeded in moving the ship a further 30ft. The news of Brunel’s difficulties reached his friend Robert Stephenson on his sick bed. Stephenson expressed disappointment that Brunel had not asked for his help, until he was informed that Brunel had no official status to request his assistance. Stephenson immediately headed south and found Brunel achieving short slips of 6ft at a time, but still breaking chains and bursting rams. Stephenson recommended more ram power, abandoning the offshore anchors in favour of driving piles on the opposite bank and stretching chains right across the river. Brunel adopted this plan but the ship still refused to move any significant distance. By the end of 1857, the Great Eastern had been moved halfway to the low water mark. In January, new rams were sourced but Brown & Lenox demanded the return of its chain which had been provided only on a short term loan. On 5 January 1858, a barque carrying a windlass and other valuable gear collided with one of Brunel’s steam barges and sank. However, Brunel had now assembled an impressive motive force of 6,000 tons, half the dead weight of the vessel. During this next attempt, the vessel moved a few inches before the rams burst. The original rams and the many replacements were supplied by Richard Tangye (1833-1906) and his brother from their workshop in Cornwall. Tangye Ltd would later claim that ‘We launched the Great Eastern and the Great Eastern launched us’. So far the launch had cost the company £1,000 a foot and the vessel was only two thirds of the way down the slipway. The ship was resting on her bottom in 6ft of water. Brunel had tons of water pumped into the vessel’s hold to ensure she did not float unexpectedly on a flash tide. The fourth spring tide from the initial launch attempt was on 30 January 1858 but a stiff south- westerly wind and a larger than expected rise in tide delayed the launch again. Weather reports by telegram from Liverpool bode well for the following day and so Brunel had the hold pumped out. At 11 o’clock on a fine Sunday morning, the Tangye rams began to push and within 20 minutes the Great Eastern was afloat. Brunel ordered that she be towed across the river, upstream of the floating debris, and that she be anchored on the Deptford shore. However, she fouled several barge cables and Brunel ordered these to be scuttled. The Great Eastern had cost £2 million to get to this stage and the trials and tribulations of the launch had taken a toll on Brunel’s health. The contract had also driven Scott Russell into bankruptcy. The Great Eastern had one more trick to play. While moored at Deptford, a strong wind came up and she broke her mooring chain, and was adrift on the Thames for over half an hour before she was secured by steam tugs. The construction and launch had run massively over budget and she still had to be fitted out. To achieve this, a second company, ‘The Great Ship Company’, was formed with a capital valuation of £340,000. This company bought the hull and engines for £160,000. The Eastern Steamship Company shareholders were given shares in the new company and the Eastern Steamship Company was put into liquidation. The vessel remained at anchor off Deptford while the commercial issues were resolved. The Great Ship Company finally invited tenders for fitting her out and received two in response – one from Wigram and Lucas for £142,000 and the other from John Scott Russell for £125,000. The work was awarded to Scott Russell; it began in January 1859 and was completed by the end of August the same year. Brunel’s ordeal in trying to launch the ship had left him exhausted, dazed and unable to sleep. He was examined by eminent experts of the time and finally diagnosed with Bright’s disease by none other than Sir Richard Bright (1789-1858) himself. Brunel was advised to take a rest cure and he went off to Egypt. The maiden voyage was originally scheduled for 30 August 1859 but had to be put off until 6 September, due to delays in the delivery of essential supplies. The day before she sailed, a frail Isambard Kingdom Brunel came aboard to inspect her. He posed in front of the main mast for photographs but then staggered and collapsed with a stroke. He was taken ashore and driven to his home in Duke Street, St James. The plan was for the Great Eastern to sail from the Thames to Weymouth in Dorset, from where Atlantic sea trials would be undertaken, and then to Holyhead. However, while passing Hastings on the Sussex coast, a massive explosion blew the forward of the five funnels off the deck. Five stokers were killed and several badly scalded by the superheated steam released in the explosion. Brunel had been confined to bed and this latest disaster was kept from him for 4 days; he died shortly after being told the news, on 15 September 1859. He would never know the pivotal role the SS Great Eastern was to play in the great Atlantic Cable story. Although designed for Far East trade, the Great Eastern only ever operated as a passenger ship on the North Atlantic route, making several trips to America between 1860 and 1863. However, the company lost money on each of these voyages, due to an aggressive price war that went on with the Cunard and Inman shipping lines. By 1864, the Great Ship Company had debts in excess of £142,000 and was forced to lay the ship up. On 14 January 1864, the SS Great Eastern was sold at auction in Liverpool for £25,000, although in materials alone she was estimated to be worth more than £100,000. She was bought by a syndicate comprising Daniel Gooch (1816-89), Thomas Brassey (1805-77) and John Pender (1816-96). Gooch had worked as Brunel’s assistant in the construction of the ship from October 1856. A new company, 'The Great Eastern Steamship Company', was set up with Gooch as Chairman and the ship was quickly chartered to the Telegraph Construction and Maintenance Company (Telcon) for the consideration of £50,000 worth of shares in the chartering company. Telcon had been formed on 7 April 1864 by the merger of the Gutta Percha Company and Glass, Elliot and Company. Gooch was also a director of Telcon and would become its second chairman. The Great Eastern was never successful as the passenger ship she was conceived to be. From her conception, she was haunted by a jinx, which killed, maimed or ruined financially hundreds of people. Her story was a mixture of high comedy and grim tragedy. However, as a cable laying vessel she was an unqualified success; she was pivotal to the great Atlantic telegraph cable project and for a decade was the primary cable laying vessel for Telcon, which had its manufacturing facilities at Morden and Enderby Wharves. Due to her size the SS Great Eastern never returned to Greenwich. To load cable she would anchor in the River Medway at Sheerness and small ships, capable of carrying around 150 miles of cable at a time, would transfer cable from the Telcon factory to her.